Navelo is a very wiry, hairy man, with a very hairy chest and hairy knuckles. He has broad shoulders framing his 5’10", 131 pound body. When he removes his helmet one can see that he keeps his dark black hair in a short butch cut. 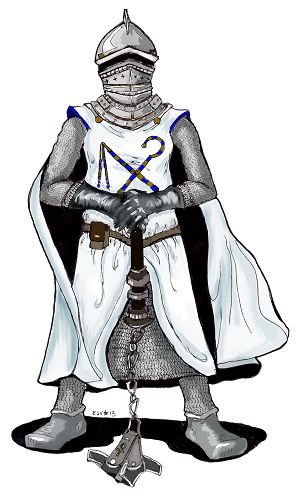 His standard clothing is a long white cape with a white tabard with the crook and flail proudly painted upon it, crossed in the symbol of his God Osiris. His chain mail leggings show below his cape entering his sturdy boots. He wears a gold and silver helmet. 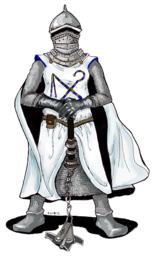 In his hands seemingly always is his giant horseman’s flail, Justice, often paired with a large iron shield which has the symbol of Osiris emblazoned on it. Navelo has a warhorse named Bucephalus.